In the context of the PhD of Arnaud Bletterer (2014-2018) [Manuscript (in french)] we proposed a local graph-based structure to deal with sets of LiDAR acquisitions. We showed how this structure is particularly suitable for processing gigantic points clouds, for resampling for instance. A. Bletterer, F. Payan, M. Antonini, A. Meftah, Towards the reconstruction of cultural heritage sites: A local graph-based representation to resample gigantic acquisitions, EUROGRAPHICS Workshop on Graphics and Cultural Heritage (EG GCH)Eurographics Association, Vienna, November 2018. In collaboration with IFP Energies Nouvelles, we proposed an efficient progressive decomposition for hexahedral meshes coming from geosciences. Our scheme generates a hierarchy of meshes at increasing levels of resolution, while ensuring a geometrical coherency over the resolutions. Our main contribution is a lossless and reversible wavelet filtering that takes into account the geometrical discontinuities but also manages the categorial properties associated to the cells. Jean-Luc Peyrot, Laurent Duval, Frédéric PAYAN, Lauriane Bouard, Lenaic Chizat, Sébastien Schneider, Marc Antonini, HexaShrink, an exact progressive framework for hexahedral meshes representation with attributes and discontinuities: multiresolution rendering and storage of geoscience models, in Computational Geosciences (Springer), March, 2019. During Jean-Luc Peyrot's PhD (2011-2014), I worked on the resampling of surface meshes, and then on the semi-regular reconstruction of surfaces acquired by stereoscopic systems. Our final objective was to develop an acquisition system that provides directly semi-regular output, instead of the classical point clouds ( that must be subsequently cleaned, triangulated, and remeshed, if users want a discretized surface with a semi-regular connectivity). Our two main contributions have been i) an efficient method of blue noise resampling of surface meshes, and a reconstruction method that directly generates a semi-regular mesh from stereoscopic images. J.-L. Peyrot, F. Payan, M. Antonini, From stereoscopic images to semi-regular meshes, in Signal Processing: Image Communication, Volume 40, p. 97-110, doi: 10.1016/j.image.2015.11.004, January, 2016. 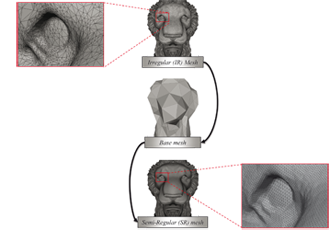 I worked on the semi-regular remeshing of surfaces during Aymen Kammoun's PhD (2007-2011) and during a collaboration with Basile Sauvage, (Icube, Strasbourg) and Céline Roudet (Le2i, Dijon). The semi-regular meshes are based on a regular subdivision connectivity. This subdivision connectivity also allows a compact representation, adapted to multiresolution analysis and wavelet compression. 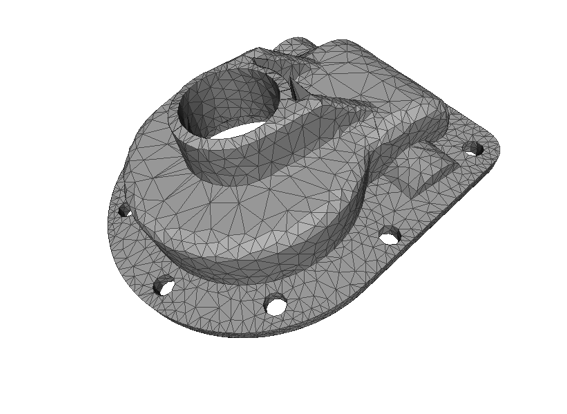 Usually, SR meshes are not provided by current acquisition systems or software. As a consequence, if we want a semi-regular mesh, we have to remesh the data. F. Payan, C. Roudet, B. Sauvage, Semi-regular Triangle Remeshing: a Comprehensive Study, Computer Graphics Forum, Blackwell Publishing, Volume 34, Issue 1, pp.86-102, doi: 10.1111/cgf.12461, February, 2015.